We started the day quite excited as today’s target plant was Astrophytum caput-medusae, one of the more recent discoveries and quite unusual in its appearance. Sometimes finding the day’s target plant is a matter of following the coordinates entered in SatNav and stepping out ‘at the flag’ and finding them next to the car (effective, time saving, but not all that exciting) and sometimes it’s hunting through an area where you know the plant should be but not knowing where it’s hiding, leading you on a treasure hunt to show you lots of other plants that you did not even knew grew here. Today was such a day. The lesson learned was ‘better preparation’. A closer look at all images from habitat available, what time of year they were taken, when is the best time to see them? etc. It was a nice coolish day, overcast with lots of rain falling over the Sierra Madre to the west. 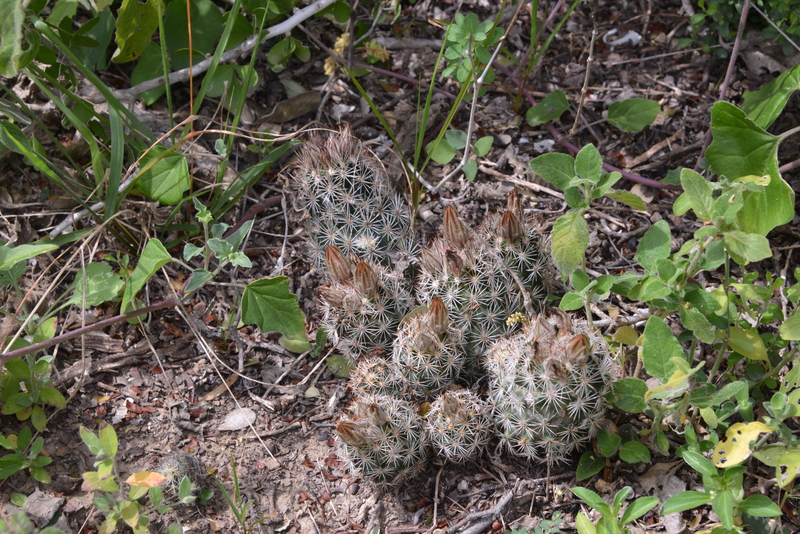 The area was very lush in vegetation, with seedlings of the omni present Cylindropuntia leptocaulis making you think that there was a possible astro under every shrub. The dense vegetation included Acacia in flower, tickling my hayfever sensors, but not causing a reaction beyond that. A bit of reading back home reveals that cacti are not the only group of plants where names have changed. The well known name Acacia is now reserved for the Australian members while Mexican and North American taxa are now in the genus Vachellia, with plants here identified as V. rigidula. Whatever the name, their thorns still hurt when you try to walk through the shrubbery. Lots of interesting other cacti, that might have been hard to find if they had been today’s target plant, so a day rewarding in different ways. We stopped to stretch our legs on a track through low shrub forest. 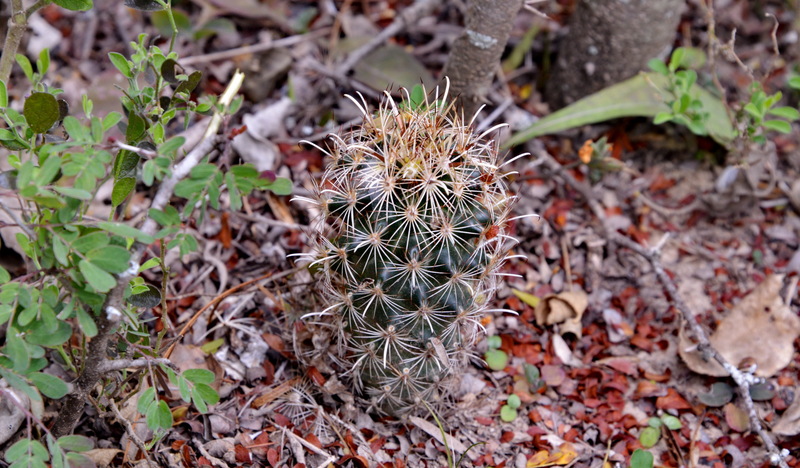 Although still in Nuevo Leon, we’re on the low lands on the border with the State of Tamaulipas, quite unlike the Mexican cactus habitats where we had been been to date. Here it was the thorny shrubbery that forced me to walk bent over, to dodge the thorns. It reminded me of the low Caatinga forest in the Brazilian State of Bahia. Here, at S3070, we photographed Echinocereus viereckii, Escobaria emskoetteriana, Opuntia sp., Sclerocactus (Ancistrocactus) scheeri and Vachellia regidula. I wanted to know what the Acacia species might be that was everywhere and in flower. It was very popular with stinging insects such as bees and there were a good number of large flies as well with dart-like organs at the front of their bodies which they were aiming at any bare flesh. Cliff in shorts was a popular target. You could smell the pollen as it entered my nose setting off hay-fever allergies, so that looking for small cacti was a little difficult with tears streaming down my face. Back home a quick search of the internet reveals that currently the genus Acacia is limited to plants growing in Australia and New Zealand while their north American cousins are now in the genus Vachellia. I think its ironic that organisms that are so firmly routed in the ground are so mobile when it comes to their place in classification systems. We moved on and drove several hours through this rather monotonous landscape. So why did our target plant grow here and not at the last stop? No idea – conditions seemed identical. It was also remote, we had seen very few cars all day. How did they discover this plant? It seems that during the construction of electricity pylons the engineers had stumbled across it and had shown it to a friend who, as a botanist, took it further. We had now reached the coordinates of the type locality and checked the spot in detail. Nothing. we spread out between this and the second set of coordinated from which plants were reported – still nothing. In cultivation, in Europe, these plants have a tendency to die during winter when traditionally cacti are kept dry for some five months. A. caput-medusae tends to drop its tubercles back to the caudex, but as plants were grafted, the caudeces are sometimes poorly developed and the tubercles never regrow. Perhaps the same happens in nature and we should be looking for the small caudeces. It’s a more positive idea than to think that all plants have been removed by illegal collectors. In the three hours or so that we searched here (S3071) we photographed Coryphantha nickelsiae, Cylindropuntia leptocaulis, Echinocereus enneacanthus, E. pentalophus, E. (Wilcoxia) poselgeri, E. viereckii, Escobaria emskoetteriana, Mammillaria melaleuca (? 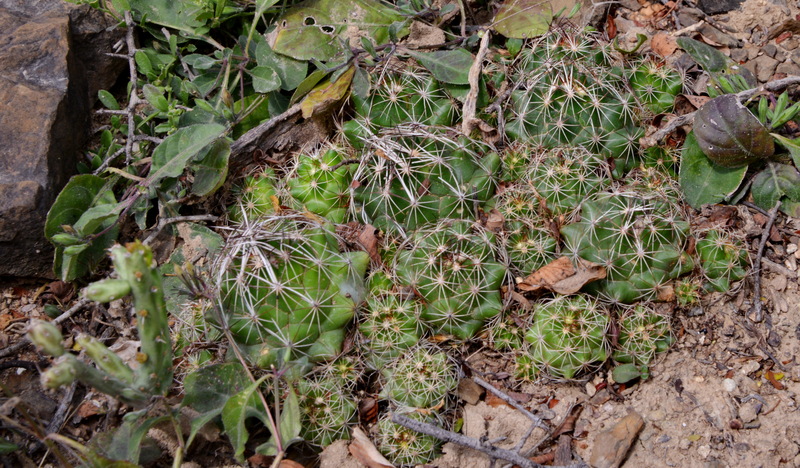 ), various Mammillaria sp, Opuntia sp., Sclerocactus (Ancistrocactus) scheeri and Vachellia (Acacia) rigidula. We’ll have to go back, better prepared, to see if we can’t find these plants second time round. Still getting used to how one-sided deafness affects me – the strong winds in habitat caused confusion and disorientation and a feeling a bit like sea sickness. All part of re-training the brain.We pushed on to Saltillo, a town holding fond memories from 2010 and 2011 but now part of the Monterrey overpopulation and industrialisation. it was late when we arrive to find that the hotel we used to stay in had a smelly fertilizer plant built right next door. The prices stank too, so we found something near by, at the other extreme of the scale – but a bit too noisy for me, even with my deaf ear.